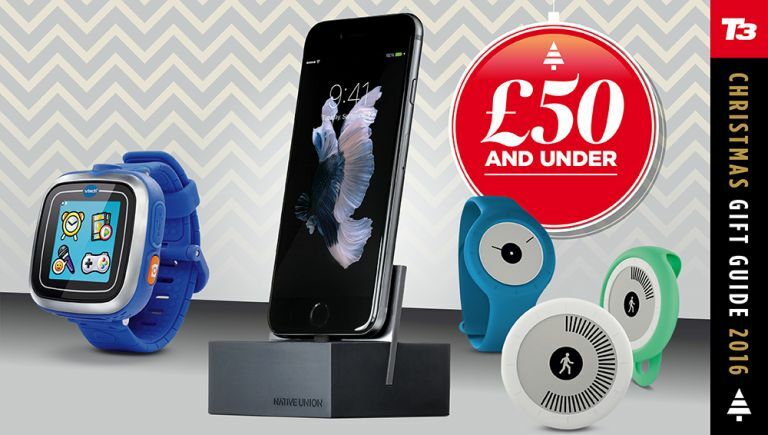 Best budget gifts: top gifts under £50! Make sure you're the favourite family member this Christmas with a selection of these excellent presents. £50 can go a long way, so whether you're buying for kids, teens, your other half, or parents, we have you covered. We've also got the best prices for you to pick from as well - or a link to the main etailer if it's not broadly available. After all, any of your family and friends would be delighted to have one of these great gifts dropping into their stocking on Christmas night - and what's more they won't cost the earth. Don't forget to check out all of our other Christmas gift guides! Loop the loop with Sonic in a psychedelic landscape, face Baraka's deadly blades once again in the original Mortal Kombat, or revisit The Ooze – this rebooted Sega Mega Drive comes with two wireless controllers, 80 classic games, and is plug-n-play ready for today's TVs. The perfect present for the V-Dub nut, this retro-styled appliance has all the charm of the classic 70s VW campervan but – crucially – it can also make toast. It comes in the classic campervan colours of Carmine Red and Pacific Blue, and there are kettles to match. Just 3.7 inches wide, the Muvo 2C will fit any Christmas stocking! It's a waterproof Bluetooth speaker delivering hefty bass, which can play tracks from a microSD card and be paired with a second unit for stereo. Plug it in via USB to customise the sound with equaliser software. You don't need Oculus Rift or PlayStation VR to enjoy virtual reality. Unfold this headset, slip in an iOS or Android smartphone and enjoy apps like Endspace VR, Lamper VR and Zombie Shooter VR. It's compatible with Google Cardboard, and collapses down for portability. The Rocket is a brilliant gift for anyone who loves the great ourdoors but can't be without a smartphone. It's not just a rechargeable camping light with two lumen settings, it will also recharge a phone or tablet, and has a built-in Bluetooth speaker. The ultimate '80s brainteaser is back and this time it's electronic, with six games built in. You control it by turning and tilting the cube, and there are even multiplayer games to try. Can you defeat Rubik's Light the Cube, Snackin' Snake or Seek & Destroy? The Mover Kit is a wearable toy that kids first make then code themselves. Its motion sensors, compass and rainbow lights are programmed while it's plugged into a computer, turning it into a range of things from a blinking bike light to a magic wand. Most Bluetooth trackers are disposable – after a year they die and you replace them. This one is not only rechargeable, but it will store a charge so you can juice up your smartphone, and has a remote button for its camera. Neat. Charge or synch your Apple device in luxury with this gold Lightning cable from PNY. Four feet long, it's sleek, tangle-resistant and a bit more unique than the standard white one you get from Apple. Another perfect stocking stuffer. Developed by the Japanese sleep therapist Miho Mihashi, the Sleep Sheep is an aromatic diffuser that emits a gentle, tranquil essential oil to aid relaxation and sleep. The sheep is handmade from natural wool and comes in three colours. The essential oil (choice of eight) comes as part of this bedtime bundle. Here's a great present for any cycling enthusiast. These lights snap into fittings the ends of the handlebars and act as indicators, for better visibility, clearer signaling and ultimately a safer ride. When the bike's parked, they unclip for attachment to a keychain. Stepping on a discarded beercap at a party is as bad as standing on a piece of Lego. That pain, and the ennui of cleaning up bottle caps, is a thing of the past with BarWise. Its handle stores beercaps, which you then empty into the bin. “Wait, I'm just charging my compact,” is not something you're likely to have heard before, but this compact contains a rechargeable battery, which can store energy for smartphone recharging and also powers the unit's light making it easier to apply makeup. Unlike most can coolers, this one really works. Before use, the cooling core is stored in the freezer. It's then screwed into the double-walled stainless steel holder. Slide in a 355ml beer can which will stay cool, while your fingers remain warm. Seasonal affected disorder (SAD) is tough. It reduces the body's production of melatonin and serotonin, and can leave sufferers disoriented and depressed. This nicely designed lamp emits light at 10,000 lux brightness, which will help combat the problem, and makes an excellent gift. The Pen Tech has a spirit level built in, along with rulers in inches and centimetres printed on the side. The top can be used as a touch screen stylus and inside there are two screwdriver heads – cross and flat. Oh, did we mention you can write with it too? Plug the Keyring receiver into your iPhone, slip the fob over an Aircharge or other Qi wireless charging unit, and it'll start juicing up your device. Wireless charging is available in an increasing number of hotels and restaurants – soon we might not need cables. A great Christmas present, and a part of British cinema history, this backpack is made from the fabric used for the UK's first IMAX screen in Bradford. When the cinema was upgraded for digital, the original screen was recycled into bags. It'll fit a 13-inch laptop. Not only does this case protect an iPhone 6 or 7 from knocks, it's got a cool, distinctive relief pattern to it featuring quirky faces, and a variety of metallic colours. Thin, original and made from a tough polycarbonate – what a great present. Give the gift of tranquility this Christmas. About the size of a coffee cup, this speaker emits relaxing ambient audio to soothe and relax, and can even help with tinnitus. Ten Sound Oasis sounds are included, and more can be added via a microSD card slot. Ideal for the millennial in your life, an Emoji Charger will banish device power-downs thanks to a 2600mHh battery. Tears of Joy is a top choice, or go for Boo, Eggplant, Unihorn or Poop models. Whoever finds one in their stocking is guaranteed to. The musical genius on your list is well catered for thanks to this holder that mounts to a guitar's headstock. Perfect for anyone who uses a tuner or tablature app when jamming, and it even works with banjos, mandolins and ukeleles.